This is an entertaining crime thriller book, which I just happen to love. There is so much going on at once! You have murders, drug lords, pregnancy, robberies, family secrets, drama and lots of mystery to solve. I thought the author’s writing was gritty and she kept you hooked from page one. I will admit to you do need to concentrate when reading this book, I got lost with all the characters at one point and had to re-read a couple of pages to figure out how everyone was linked. Hunter, a man on a mission, takes no crap and is investigating a murder on a golf course, also has a twinkle in his eye for a certain lady. 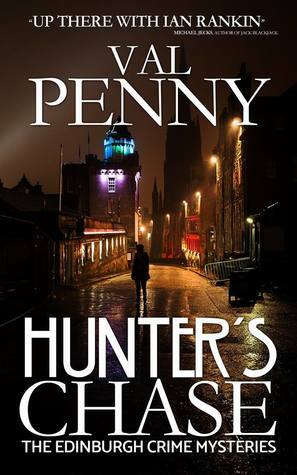 He has a new team member, Tim, the son of the ex-Chief police constable and someone who Hunter really does not like. Tim must prove himself to Hunter to show that he is not like his dad, trying to always escape the huge shadow he has created. I really liked his character. It is my first introduction to Hunter and his team (being the first book and all), and it is not going to be my last (you must wait until September for that one!). I did love that you got to meet the whole team, each getting their own screen time so to speak, as they are all part of the investigation. They become real people like the main character, as the author fleshes them out which makes this book so much more of a gripping read, as you become invested in them all. What is more amazing, this is a debut book! What an introduction indeed! Sign into Goodreads to see if any of your friends have read Hunter's Chase.